The VPME – The Best Place for New Music:Award Winning Music Blog. Interviews, downlaods, reviews. A number of years ago my dear eccentric grandmother was having one of her infamous ‘spring cleans’. During her previous indiscriminate ‘purges on clutter’ she’d not only managed to throw out a perfectly acceptable, fully functional keyboard but also my uncle’s electric guitar and amp. He still cannot bring himself to talk about his loss to this day. And so when I overheard that she was about to embark on yet another of her notorious ‘clear outs’, I dashed around to her house with indecent haste, ostensibly to ‘help’, but in reality furtively hoping I might unearth all manner of discarded riches (or my Uncle’s bass guitar at the very least!). ‘Help yourself lad, take what you like’ she said, pointing at two swollen bin bags, all neatly packed in readiness for their voyage to the local Charity Shop. Alas, these bin bags, whom minutes earlier had positively groaned with the possibility of imagined treasures, yielded nothing more interesting than a leopard print pashmina stole, a rather ostentatious faux fur coat, a rather disturbing peroxide wig, sunglasses and three pairs of vintage high heels. A tidy haul no doubt for a budding drag artist, or Lady Ga-Ga impressionist, but of little or no use to me. VP: Hello Sarah, how did you decide on The Good Natured as the name to release your music under? Would you say it describes your own disposition? Or your music ? SARAH: I wouldn’t say it describes my music per se, however I am quite a nice person so I consider it most appropriate! VP: Your new single, “Your Body Is A Machine” is quite a dark sounding number, what’s it all about ? SARAH: The song itself is all about self indulgence, destroying your body with drugs and alcohol and hurting someone else in the process. VP: Any imminent plans for an album release? VP: How did you first become involved in making music yourself? SARAH: I played the violin when I was little, then I progressed onto learning to play the drums. This was the stage when when I really got into music. After that I taught myself how to play the keyboard and that’s when things really took off and I started writing songs, probably when I was about 15 or 16. VP: What sort of music would you say has influenced your own output? SARAH: All sorts! My parents record collection, so old stuff from the 80’s like the Human League, Sparks, Japan, Siouxsie and the Banshees. Some folk music too like Nick Drake. I also like pop music such as Timbaland. I suppose it’s quite a broad and eclectic range really. VP: There has certainly been an explosion in female led electronic music of late any new artists from this genre you admire? SARAH: I love Fever Ray, and I think Marina is great. VP: I believe you’ve started to take singing lessons, is this so you breathe properly and don’t asphyxiate on stage? SARAH: Well, to be honest I have only had one, but yes I do hope that it will really help improve my all round technique and my breathing. VP: What do you make of social networking, I imagine it’s almost a full time job these days for artists, but it is a great way to connect with fans and get instant feedback. SARAH: I think it’s great to engage with people who like what you do, and it’s amazing how you can talk to fans so easily! I must admit I do get a bit fed up of twitter sometimes; I think it takes away that certain air of mystery if you tell people what you are doing all the time. For example I don’t really want people to know what I had for breakfast! VP: Finally, you’ve already covered The Cure’s ‘Love Song’, any other song’s would you love to cover and why? SARAH: Hmm, maybe Mad World by Tears for Fears purely because I love that song! VP: Oh dear…I forgot to ask my traditional, describe your music in five words question and so before sacking myself. . . I’ll do it. . . I once found a pair of Bloomers in my Grannys attic. I m very impressed with Your Body Is A Machine. A typically Von-Pipian eye opener, this one. I look to Andy to introduce me to the latest in this style of music and he never fails to do so. With a preamble as entertaining as the feature itself (I still think he could have possibly tried on some of that stuff he found in his granny’s bin, though chances are it would have fit as tightly as those John Moore t-shirts we were harrangued into aquiring some time ago) it is the music featured that keeps me coming back time and time again. I do also agree with Sarah that Twitter has a way of bringing out some of the more mundane thoughts in people. I think there can be a bit too much of the simpleton day-to-day sharing in that regard. 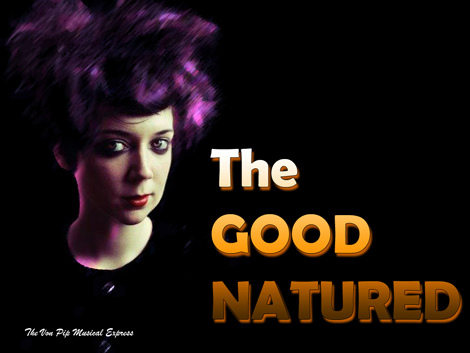 Anyway, off to get me some The Good Natured! Pingback: Sharing Is Caring… New Band Tips For Autumn, From Bloggers, For YOU | A New Band A Day! Track Of The Day – “Boundary” By Ivory Seas. Track Of The Day – “Hide” By Access Royale. VPME Track Of The Day “Carver’s Kicks” by Straylings.